Oct. 10, 2012, 10:03 a.m.
After being sold over the summer, the newspaper is hiring about 50 editorial staffers and adding new print sections — because print’s where the money is. By Adrienne LaFrance @adriennelaf Oct. 10, 2012, 10:03 a.m. The paper has a renewed focus on high school sports — regularly covering dozens of games with a reporter and photographer at “every single one,” editor Ken Brusic told me. It’s part of a beefed up high school sports section, which is just one of the changes that came in the wake of the newspaper’s sale to the Boston-based investment group 2100 Trust over the summer. The Orange County Register has also listed a slew of investigative reporting jobs, and introduced a new free-standing business section. All in all, the paper’s hiring about 50 editorial staffers to add to the 180 they already have. For most American newspapers, the print product still produces around 80 percent of revenue. And while online advertising has generally been a disappointment for them, print circulation declines have slowed or plateaued at many papers. Few would bet on newsprint’s future 10 or 20 years out, but in the meantime, print remains the medium where newspapers hold their strongest competitive advantages. The balance that everyone’s trying to hit is how to make as much money from print as possible — for as long as possible — to pay for the digital transition, where the dollars are currently too small to support the business. If the OC Register can pull off this major hiring spree and show that it works, it will be amazingly great for print journalism. As you may be aware, the Orange County Register was recently sold to new owners who are spending a great deal of time and money improving the quality of our print newspaper. Already, they’ve added a daily business section, hired a new business editor, hired an award-winning fulltime restaurant reviewer and numerous other changes that are going to make our paper even better than it was before. POSTED Oct. 10, 2012, 10:03 a.m.
LaFrance, Adrienne. "The Orange County Register is hiring dozens of reporters, focusing on print-first expansion." Nieman Journalism Lab. Nieman Foundation for Journalism at Harvard, 10 Oct. 2012. Web. 25 Apr. 2019. LaFrance, Adrienne. "The Orange County Register is hiring dozens of reporters, focusing on print-first expansion." Nieman Journalism Lab. Last modified October 10, 2012. 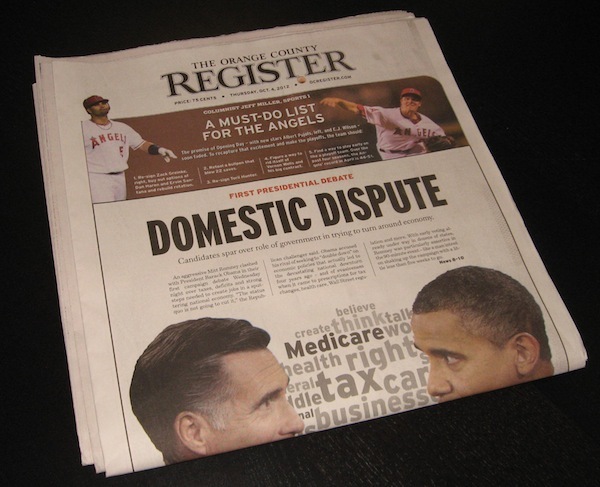 Accessed April 25, 2019. https://www.niemanlab.org/2012/10/the-orange-county-register-is-hiring-dozens-of-reporters-focusing-on-print-first-expansion/.